Although West Indian Manatees spend the warmer months in the Gulf of Mexico, they begin to migrate north as the gulf waters cool down in the winter. In fact many Floridians joke that they know autumn is over when they begin to see the manatees in their winter refuges — places like Manatee Springs State Park (www.floridastateparks.org/park/manatee-springs). And that’s good news for visitors, as the annual migration offers an excellent opportunity to get a closer look at these massive mammals. But the manatee migration isn’t just motivated by comfort issues; in fact it’s actually a life-saving journey. Even though manatees are large, they have relatively little body fat, so their metabolic rate is low compared to other marine animals. So low in fact that in temperatures under 68° F, manatees can’t produce enough metabolic heat to make up for the heat loss in their bodies. In short, if they don’t move to warmer waters they will freeze to death. And Manatee Springs State Park is a very welcoming place for them — a place they return to year after year. During the winter months the manatees make their way up the Suwannee River to the warm and welcoming 72° waters of this first-magnitude spring. And since the spring run is closed to boat traffic, the waters are safe for the migrants, and as a result the winter population continues to increase. The best place to get an up-close-and-personal look at the manatees is from the accessible boardwalk, which is located just to the left of the concession area. 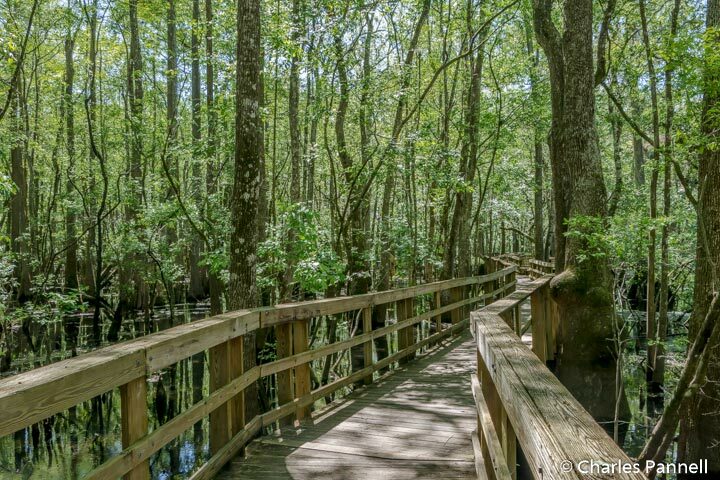 This nicely done pathway meanders over a cypress swamp, and has benches and interpretive plaques along the way. It’s shaded by the trees, so it’s a good spot to escape the midday sun, and enjoy the view of the lovely blue-green crystal clear waters. The quarter-mile boardwalk ends at a dock on the Suwannee River, which has a few benches and a shade cover. Ranger-led programs are often conducted on the boardwalk, so be sure and check at the ranger station for a current program schedule. Another boardwalk is located on the other side of the swimming area. This short trail leads over to a hard-packed dirt trail out to the beach. There’s ramp access from the beach down into the water, and there are also a few standard picnic tables in a level dirt area nearby. Although the tables aren’t technically accessible, they are doable for many people, as there’s plenty of room to roll up alongside them. 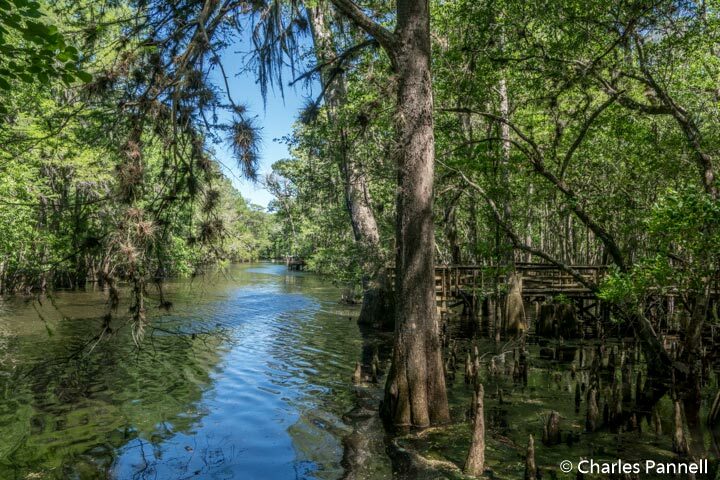 So pack a picnic lunch and head out to this Northwestern Florida state park, to enjoy a little manatee watching this winter. But don’t tarry, as come spring they will be on their way back to the Gulf of Mexico.